On Friday, May 6, 2016, the Honourable Pamela Williams, Chief Judge of the Provincial and Family Courts of Nova Scotia, joined her colleagues on the Mental Health Court Team to welcome members of the Standing Senate Committee on Legal and Constitutional Affairs to the provincial courthouse in Dartmouth. The Senate Committee normally meets in Ottawa, but the eight Senators requested a visit to Nova Scotia to learn more about the success of this province’s therapeutic and restorative justice programs, in particular the Mental Health Court. Senate Committee members viewing the Wall of Hope inside the Mental Health Court in Dartmouth. The Senate Committee's visit was part of a larger study to examine and report on matters pertaining to delays in Canada’s criminal justice system and to review the roles of the Government of Canada in addressing such delays. This was a unique opportunity to showcase the innovative and collaborative approach taken in the Mental Health Court. It also gave the team a chance to highlight the community partnerships behind other diversion and treatment programs in the province that help improve access to justice and better connect offenders, victims and their families with the services they need. The Senators’ day started in Halifax where they sat in on a sharing circle, a common exercise used in restorative justice programs. The event was organized by Jennifer Llewellyn, a professor at the Schulich School of Law, who also spoke alongside Chief Judge Williams on a panel later in the day. 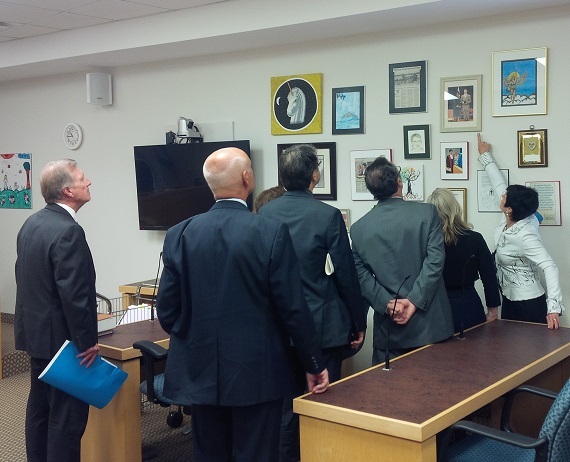 In Dartmouth, the Senators had the chance to see inside the courtroom where the Mental Health Court is held once a week, including the Wall of Hope showcasing artwork by some of the program’s participants. Afterward, the Chief Judge and members of the Public Prosecution Service, Nova Scotia Legal Aid, the Department of Justice and the Nova Scotia Health Authority spoke about their roles on the Mental Health Court team and answered questions. The visit wrapped up with a public hearing in Halifax, the 17th hearing for this study, where Chief Judge Williams and Jennifer Llewellyn spoke about their experiences in the system and took questions.